The late 1920s and early ’30s saw Rolex at its most creative and dynamic. Having launched the world’s first truly waterproof and commercially successful (Oyster) watch in 1926, this relatively young company, est. 1906, went on to launch its first automatic waterproof wristwatch, the Oyster Perpetual Chronometer in 1934. These groundbreaking achievements are the foundations on which the company we know today was built. However, even at this early stage of development, this highly ambitious company offered a wide range of models to the market, many of which we seldom see today, due to relatively low production numbers. The wristwatch we see here is just such an example, which if we take a moment to consider, bears little relationship with the pocket watch from which it descended only fifteen or twenty years earlier and which continued to remain popular right up and until the Second World War. Though not officially referred to by Rolex as the Tank, there is little doubt this model was produced in response to the success of the Cartier Tank model, released in 1919. This was so called, because the outline of the watch case somewhat resembles the aerial view of the WW1 military tank. Prior to this, all watches were round, reflecting the shape of the movement. However, during the 1920s and ’30s, rectangular case design watches became hugely fashionable, which is why now perhaps, we loosely associate these designs with our Grandfather’s watch. Finding good examples of any pre-WW2 Rolex has become increasingly hard over the past 10 years, however finding an example of this design is very difficult. Most are in the hands of collectors and seldom come to the market. The case measures 26mm across, excluding the correct Rolex crown, and 31mm from top to bottom. This may seem a little small, but it is, in fact, a very large watch for the period, especially when one considers it is 38mm from lug to lug and 44mm across the diagonal. The case is hinged at the top and swings open from behind and can be pried open using the lip on one end with one’s thumbnail, revealing the dial. The movement can then be removed without any tools by gripping the dial and gently easing it and the attached movement away from the case-back. When acquiring such a rectangular or square watch, especially in gold, it is important to ensure the case shows no wear, no fatigue cracks and no pinholes, particularly around the hinge and corner areas. This type of case is prone to wear and damage in these areas, which is another reason these watches are rare, as cases become beyond repair and restoration. Fortunately, this example has been very well cared for and lightly used, so apart from our usual careful examination and cleaning, the case has required little work apart from some very light hand-polishing. There are no scratches or dings, and no damage/wear visible to the naked eye. Inside the case-back is correctly signed: Rolex Geneva Suisse, along with “20 World Records”, indicating the number of ‘prizes’ Rolex had won at worlds watch fairs. 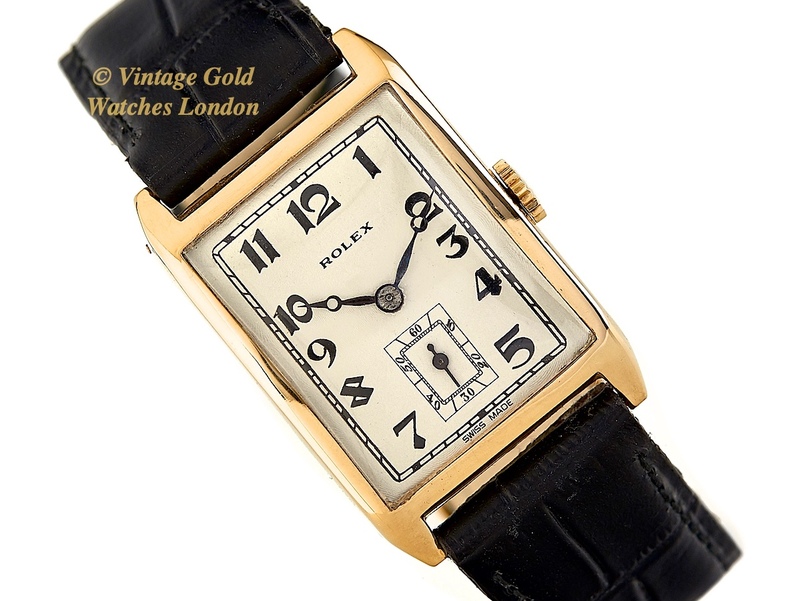 The case, in common with the majority of Rolex gold cases of this period, was hallmarked in Glasgow, U.K and the hallmark dates this watch to 1928. Externally, the case-back also carries the Rolex reference number 34 and the case serial number 55826. As can be seen, these numbers are clear and distinct, which is a very strong indication this watch has been very lightly used. Many rectangular watches of this period carried dials with ‘art-deco’ influences and this can be seen to a degree, in the design of the numerals. Square and rectangular watch dials present certain challenges to dial designers, but here the approach is very simple with Black standard Arabic numerals on a slightly Off-White dial with a complementary rectangular subsidiary seconds dial at ‘6’. The dial carries the original blued steel hands which are in excellent condition and also is correctly signed: ‘Rolex’ with ‘Swiss Made’ at the very bottom. The movement fitted to this watch is the original 10½ Hunter, 15 Jewel Extra Prima movement used in Rolex’ highest quality watches of this period. As may be noted from the photographs, this is the especially high grade ‘Timed to 6 Positions For All Climates’ movement as used in Rolex’ chronometer movements. The movement is in very clean condition having just completed a full overhaul and service by our vintage Rolex specialist watchmaker. This means it has been completely dismantled to each of its component parts before cleaning and inspection under high magnification, replacement where necessary with only genuine Rolex parts, then careful reassembly, adjustments and oiling to Rolex specification, before final calibration and testing. The movement is therefore now running accurately and within expectations of 30 seconds per day. The timing expected of a Rolex movement of this period is within 1 minute per day, and this is our guarantee. The power reserve when fully wound on this movement is 30 hours. We are therefore confident in offering this watch with a 12-month written warranty*. The movement is signed Rolex, Swiss Made and 15 Rubies. A high quality, new Black Crocodile strap is fitted along with a gold plated Rolex buckle. If a different colour or style of strap is preferred, we will do our best to oblige at no extra charge. Although there is no original paperwork with this watch, the reference numbers, markings, signatures and hallmarks are all correct, dating the watch to 1928. A detailed Particulars document will be included with the receipt, along with our 12 months’ warranty*. A separate insurance valuation for the replacement value of this watch will also be provided at the time of sale along with our unique ‘Lifetime Authenticity Guarantee’ which states: “If this watch proves to be anything less than totally authentic, or not as described, Vintage Gold Watches of London will offer you a full refund at any time”. The watch comes complete with high-quality hardwood presentation box. We love to find, restore and make available, fine old vintage gold Rolex watches of this rarity, quality and condition. This is a superb, highly collectable (and usable) vintage watch from horology’s most famous name, which will provide an excellent financial investment as well as something to treasure and enjoy! It will make an excellent evening wear dress watch as well as a practical, highly accurate and reliable timepiece to use on an everyday basis.